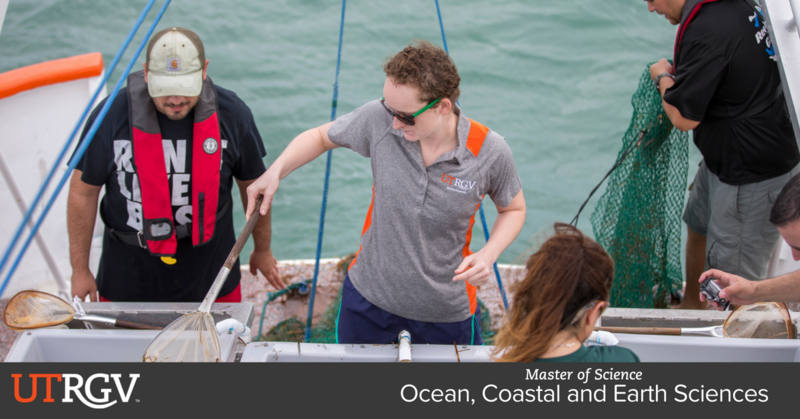 The School of Earth, Environmental, and Marine Sciences at The University of Texas Rio Grande Valley offers a Master of Science in Ocean, Coastal, and Earth Science (OCES). The goal of the OCES program is to provide students a unique integrative education and training experience that prepares them to meet the challenges and opportunities in the multiple dimensions of contemporary marine, coastal, and environmental science disciplines. Specifically, the OCES program targets students wishing to pursue a graduate degree with the intention of entering the work force to contribute their gained expertise and comprehensive understanding of complex ecological and resource systems made up of biotic and abiotic components coexisting and interacting with human communities and relevant socio-economic activities in ocean and coastal zone environments. This multidisciplinary degree program is designed to provide a rigorous applied and theoretical education in the marine and coastal sciences with emphasis on the environmental impacts of anthropogenic and natural forcings along the Texas coastline and beyond. Students graduating from the program will be prepared to take on decision-making positions in a wide range of governmental agencies and NGOs. They can expect a broad set of science careers, within and beyond academia, including private and public sector organizations concerned with marine and coastal systems, recognizing that rivers, estuaries, and the oceans are fundamentally important to our societies. The educational objectives for students in the OCES program are: attaining a thorough understanding of marine and coastal zone dynamics at various levels of organization; 2) attaining quantitative and qualitative data-interpretation skills from raw experimental results as well as from interpretation of primary literature; 3) developing technical and intellectual skills to design, carry out and interpret results of experiments addressing marine and coastal problems employing a wide range of multidisciplinary, state-of-the-art approaches; 4) acquiring verbal and written communication skills to entertain professional discourse with experts within the discipline, exchange scientific ideas between researchers of diverse backgrounds and effectively communicate with a lay audience; and 5) developing and enhancing existing critical thinking skills through hands-on problem solving. Step #1: Submit a UTRGV Graduate Application at www.utrgv.edu/gradapply. The university application fee of $50 ($100 for International Applicants) can be paid online by credit card or electronic check (in the online application). All application fees are nonrefundable. *Please Note: If you are a graduate of UTPA, UTB/TSC, or UTRGV you do not need to request an official transcript to be sent to the Graduate College. Bachelor's degree from a regionally accredited institution in the United States or a recognized international equivalent in a similar or related field. Undergraduate GPA of at least 3.0. Official transcripts from each institution attended (must be submitted directly to UTRGV). GRE General Test with minimum GRE scores of: Verbal 153 and Quantitative 144 are required. GRE test scores are valid for 5 years. A waiver of the GRE requirement will be granted to applicants who show proof of completing a graduate degree (master’s or doctoral). TOEFL or IELTS Language Proficiency Test with minimum scores: 550 on paper-based, 213 on computer based, or 79 on Internet-based for the TOEFL; 6.5 for the IELTS. TOEFL and IELTS scores are valid for 2 years. For additional information, visit the Additional Documents for Domestic Applicants who Attend Foreign Universities section of our website. Certified English translation of educational records. TOEFL or IELTS Language Proficiency Test with minimum scores: 550 on paper-based, 213 on computer based, or 79 on Internet-based for the TOEFL; 6.5 for the IELTS. For additional information, visit the English Proficiency Exam section of our website. Financial Documentation showing sufficient funds to cover all expenses (living and academic) for the first year of study. For additional information, visit the Financial Documentation section of our website. Immigration documents, including a current copy of your valid passport. For additional information, visit the Immigration Documents section of our website. SEVP regulations prohibit the issuance of a Form I-20 based on conditional admission, effective July 13, 2016. University officials can only issue a Form I-20 when students have met all standards for admission for the program of study listed on the Form I-20. These standards for admission include any English proficiency requirements. Applications will be accepted year round and prospective students are encouraged to apply at least 2 months before classes start to ensure a timely application review. Applying early will also give prospective students the best opportunity to be considered for scholarships and other possible funding opportunities. *Note: This program only admits applicants during Fall and Spring semesters. **These courses are in a prescribed elective block. Students wishing to select from this block must choose a minimum of 6 hours. The remaining courses in the block may still be used as prescribed electives. Courses from any discipline that pertain to policies and management of the environment and natural resources, may be taken with the approval of the GAC. Discussion and analysis of active areas of research in the areas of Earth, Environmental, and Marine Sciences. This course will include discussion of mar1ne ecosystems and processes with a focus on the marine environment of South Texas. Not open to students with previous credit for MARS/BIOL 4426. This course seeks to provide students with an understanding of key concepts related to natural resource and ecosystem management, including socio‐ecological systems, collaborative network theory, ecosystem service valuation, as well as the diversity of private stakeholders and government institutions Involved In the decision making process. This course provides a comprehensive study of the physical and geological processes controlling the morphology of coastal environments. Beach, estuarine, deltaic, lagoonal, barrier island and shelf processes and environments are examined in detail. This course provides a comprehensive study of the cycling and Interactions of elements essential to life throughout the Earth system including the influence of biological, geological, and chemical processes. This course provides a comprehensive study of advanced quantitative treatment of surface water and groundwater hydrology, focusing on analysis of observed hydrologic and hydroclimatic variability, and their interpretation in terms of the underlying biological, geological, and chemical processes. This course provides a comprehensive study of the environmental physiology and population ecology of aquatic organisms including aquatic plant and animal physiology and population responses. This course is an applied experience in an industrial, educational, private agency, or government facility. A maximum of 3 SCH of Graduate Internship will count toward the degree; subsequent enrollments will not count. This course is to prepare students for becoming be effective teaching assistants during their graduate careers and to prepare them for independent teaching and presentations. A maximum of 3 SCH of Supervised Teaching will count toward the degree; subsequent enrollments will not count. Faculty supervised research designed for students who are working on a research or the thesis project. A maximum of 6 SCH of Graduate Research win count toward the degree; subsequent enrollments will not count. This supervised research course will include design of an original research problem with a written proposal, collection and analysis of original data, and writing of a scientific report in acceptable publication format. A maximum of 3 SCH of Thesis I will count toward the degree; subsequent enrollments will not count. This supervised research course will include design of an original research problem with a written proposal, collection and analysis of original data, and writing of a scientific report in acceptable publication format. A maximum of 3 SCH of Thesis II will count toward the degree: subsequent enrollments will not count. Specialized lab content for contemporary topics in environmental sciences not available in other courses. May be repeated for credit as topics change. An in depth review of the distribution of natural resources, with special emphasis on new solutions to problems of resource scarcity. Topics include: energy, water, air and food resources and other selected components of the lithosphere, hydrosphere, atmosphere and biosphere. Economic, demographic, and political issues are considered as they affect natural resources. Specialized lab content for contemporary topics in geology not available in other courses. May be repeated for credit as topics change. Specialized lecture content for contemporary topics in geology not available in other courses. May be repeated for credit as topics change. This course is a series of lab/field investigations in areas not available in other courses. A student may take this course up to three times for credit as the topic changes. Prerequisite: Graduate Standing. Topics will cover specialized areas of study in Marine Biology that tend to not be part of regular course offerings. Subjects may vary from semester to semester, depending on the faculty member teaching the course. A student may take this course up to three times for credit. The common local marine flora Including the microscopic and algal forms and aquatic angiosperms. Not open to students with previous credit for MARS/BIOL 4410. Laboratory fee. This course will include discussion of marine ecosystems and processes with a focus on the marine environment of South Texas. Not open to students with previous credit for MARS/BIOL 4426. This course examines the major nearshore habitats and communities of the western Gulf of Mexico including: beaches, sand dunes, estuaries, salt marshes, mud flats, sea grass meadows and rocky shores. Emphasis is placed on directed, field‐oriented, individual research projects. Prerequisite: Graduate standing and one course in general ecology or zoology or consent of the instructor. Structural, physiological and ecological relationships of common marine animals, stressing invertebrates of coastal waters. Not open to students with previous credit for MARS/BIOL 4402. This course investigates the interactions between organisms and the physical processes that regulate productivity and distribution of marine life in oceanic and coastal ecosystems.